There is a lot of talk in the dog world, especially in the West, about how obese dogs are and how we need food that will slim them down but still give them all the nutrients and vitamins they need every day. Like humans, dogs have a tendency toward obesity. Well we have gotten those obese dogs, all kinds of weight reduction and weight management foods. But what about the other side? What about dogs that need to gain weight? 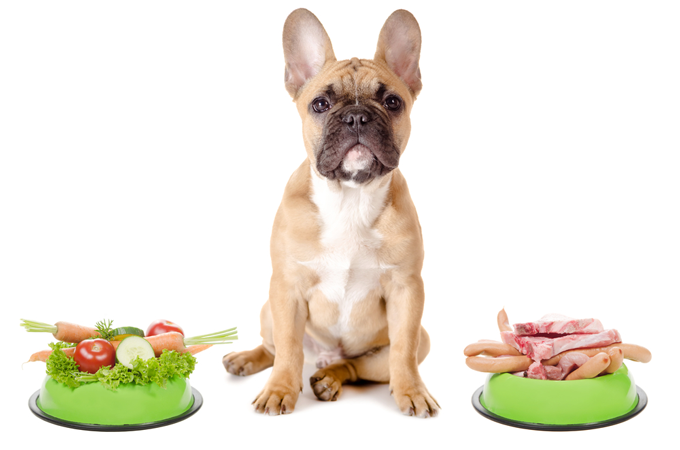 What Is The Best Dog Food For Weight Gain? This is so uncommon in our experience that we don’t know what to do if it happens to our dog. We really don’t even know the symptoms or look of an underweight dog. For the look of an underweight dog, a healthy dog should have a layer of muscle and some fat over his ribs, but you still should be able to feel their ribs if they are not overweight. An underweight dog will clearly have ribs, shoulders and even hip bones that are visible. If there is an illness associated with the weight loss, they might be sluggish and not interested in anything. An underweight dog might not have the usual shine to their coat. They might appear depressed or have serious lack of energy. Why would a dog need to gain weight? It is true that in the West, dogs are pampered, and the obesity issue is much more prevalent. However, there is a growing component of underweight dogs for any of the reasons mentioned above. Therefore, there is also a growing need for high quality dog foods for underweight dogs. With a puppy you want to keep them at an ideal weight so that they will continue to grow. However, puppies should not be overfeed, or they can grow too quickly. An underweight adult dog should be brought to a healthy weight as well, but slowly not quickly. You will want to rush it once you know your dog is seriously underweight but packing it on too quickly can have its own problems. Go slowly. A good way to bring an underweight dog up to his ideal weight is found below and needs to include an extra or high calorie dog food. 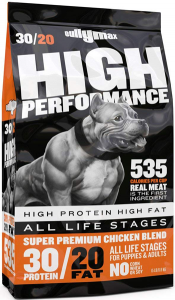 First of all, choose the best high calorie dog food that contains high protein and high fat content. We will review some of these in this article but do your homework. Get something that works for your dog in both taste and nutrition. Feed at least 3 times a day if not five to six times. Make the servings smaller but increase the number of times you feed. If your goal is 1000 calories a day you can feed 5 meals of 200 calories or 3 meals of 330, there is a lot of choices of high calorie dog food. Make sure the food is high protein and not just high fat. Free feeding – or leaving your dog to eat when he wants will work for some dogs and not for others. A lot depends on the breed. Some dogs will only eat when they are hungry but a Corgi for instance, will eat anything he sees. You can free feed the first type of dog, but you can’t free feed the corgi type of dog. Use supplements and treats. Choose these carefully as well. There are many supplements that will increase protein and fat content and can be sprayed right onto the food. Don’t use a supplement to replace a high-quality dog food. You can give high protein treats but remember just as it is with humans, read the label. Don’t give too much in terms of fatty treats. That might put weight on your dog, but it will be just fat not the combination of fat, muscle and nutrients that you really want and your dog needs. 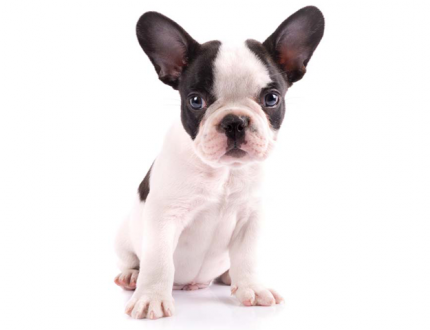 With a puppy make sure you are feeding it with a high-quality puppy growth formula dog food. Don’t feed adult dog food to a puppy unless it is designed for both. Different dogs will respond differently to different dog food formulations. Your dog can gain weight one of two ways. You can feed it with a high quality, calorie and protein rich dog food several times a day in small portions or you can feed it more than it is eating now. It is healthier to choose the first way. If you just feed more of what you are feeding now, your dog will gain weight, but it will be from a lot of “empty calories” from artificial ingredients, meat byproducts and grain or soy. We think feeding a little more of a high protein, high fat food rather than a lot more of your current food. This is where we put our focus. Should this food be dry or wet? Dry food has more carbohydrates and fillers than wet food. Whichever you choose, make sure the food has enough calories. High calorie dog food is made from all natural non-chemical ingredients. It has no artificial color, no preservatives and little “filler”. Instead it is full of fats from healthy sources. Ingredients like chicken fat or canola oil are full of calories and should be near the top of the ingredient list. Look for fish oil, flax seed oil and omega-3 & 6 fatty acids. Another factor in your attempt to help your dog to gain weight is that often dog food is identified by the size of your dog. Some brands are beginning to produce breed specific foods, but this is in its infantry stage. The size of the dog has been a factor in dog foods for a long time. Large Dogs to Giant Dogs – will have more ingredients that add fat and calories quicker than the ingredients you will find in Toy to Medium Size Dogs. We will show some of these as well as brands that can be fed to all size dogs. Though this food is named and designed for the Bully dog breeds and mixes, any dog can benefit from its quality of ingredients. It is the highest protein rich food on the market. Yes, it is expensive. Yes, it is worth it as are most foods on this list. 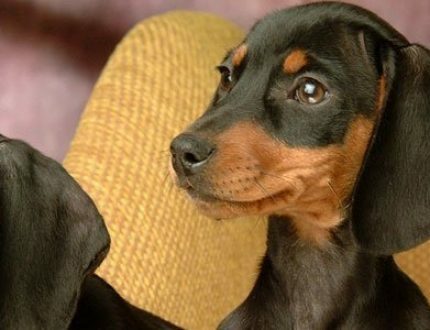 We talked earlier about both puppies and adults gaining weight in a way that is healthy. This dog food does that. With 30% crude protein, it has the top formula in the market for high-calorie dog foods. In addition to helping your dog to gain weight, it is also going to help your dog gain muscle and not just fat. This formula has 20% fat. For pit breeds it is the number one dog food. No other food has 535 calories per cup. The label list ALL ingredients and nothing is hidden. Previously we said to look for ingredients like chicken fat or canola oil which are full of calories and should be near the top of the ingredient list. Look for fish oil, flax seed oil and omega-3 fatty acids also. The number one ingredient in this brand is chicken meal not to be confused with chicken by-products. By-products are not the best parts of the chicken but rather all the throw away parts, whereas chicken meal is ground chicken and very high in protein. Chicken fat is #3 on the ingredient list. We will not copy the entire ingredient lists for each product we review. We will look for the categories listed above. Calories per cup; Crude Protein; Crude Fat; Digestible Carbohydrates; Source of Omega 3 Fatty acids and where is chicken fat, canola oil or fish oil in the list of ingredients. This food is not to be confused with the previous one even though the names are very similar, and the brand names are very similar. This brand is Maximum Bully while the first brand is Bull Max. 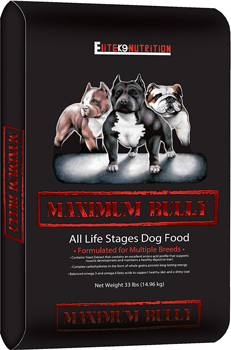 Even though these high calorie dog food are aimed first at the Bully Breeds, it is just as effective for all breeds of dogs. 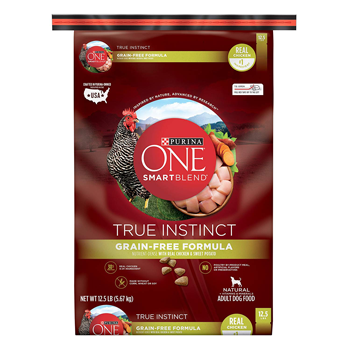 This product gets its protein from chicken and pork with a strong yeast protein component. Includes digestive promoting ingredients such as oatmeal, probiotics, cranberry and pumpkin. The first three items on the ingredients list are chicken meal, pork meal and chicken fat. It also contains fish meal, pea protein and yeast extract. 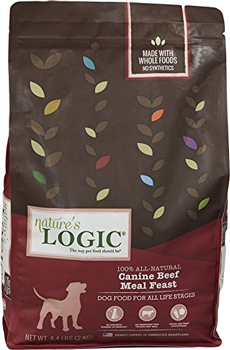 This Product is all natural and it’s a very high calorie dog food as well. It is designed for growing dogs to keep them healthy without getter fat. With natural vitamins and minerals and protein of globulin and albumin, your dog will fill out with muscles rather than fat. This is one of the most unusual brands we are examining. It is a product made with raw materials that have been freeze dried into a kibble and it is also high calorie dog food. This line is made from USA raised beef. 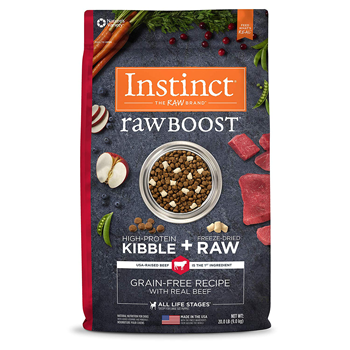 This is the number one ingredient in Instinct Raw Boost Grain Free Natural Dry Dog Food Beef. High Protein – made with 85% -95% real beef and beef organ meats. Probiotics – a boost in probiotics and additional antioxidants and higher Omega Fatty Acids to assist with digestion, immune system and skin and coat health. No grain, no potatoes, no corn, no wheat and no soy. Only meat, vegetables and fruit. No by-products, no preservatives and no artificial flavors or colors. Only meat, vegetables and fruit. 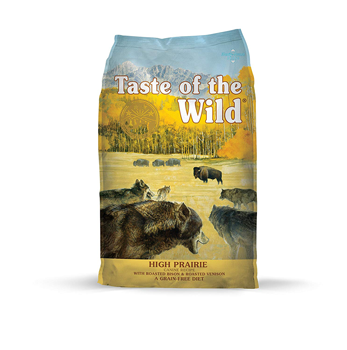 First kibble product to mix grain free, high protein dry dog food with freeze dried raw food. Minimally Processed – never cooked – remains raw. Fresh non-GMO vegetables and fruits for minerals and vitamins 5-15% of the recipes. Made, packaged in the United States with only meat and vegetables, fruits grown in the United States. As you can see, I have spent more time on this brand than any of the others. This is because the Instinct brand is different from any of the other high protein, high calorie dog food. The philosophy of the brand is to use only the very best ingredients in the closest to nature state. This is the grass-fed beef and non-GMO vegetables and fruit, no use of synthetics, or artificial vitamins and minerals. No powdered proteins. This is true of all their brand products using only cage – free chickens and grass-fed lamb as well as the USA raised grass fed beef. The Instinct brand started by making raw pet food and since then have been attempting to make it more accessible to the general public. These dry kibble formulas are a large step in that direction as all the public has to do is feed the kibble as usual. The first line of ingredients in this formula are: Beef, Turkey, Herring Meal, Peas, Chicken Fat, Tapioca, Chickpeas, White Fish Meal, Dried Tomato Pomace, Natural Flavor Freeze Dried Beef, Lamb Meal, Menhaden Meal, Freeze Dried Beef Liver, Pumpkinseeds, Freeze Dried Beef Heart, Freeze Dried Beef Kidney, Freeze Dried Beef Spleen. As you can see the initial ingredients are almost all meat protein and interspersed with good vegetables. Compare these ingredients to the ingredient list on your current dry dog food. There are 12 meats or meat meal in the first 17 ingredients. No other food we have found packs in this much protein in so many different forms, especially the organ meat which we know is packed with protein. 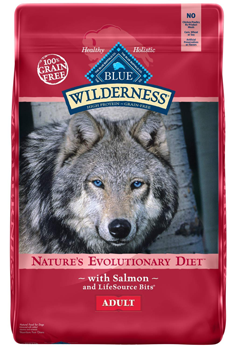 This is a holistic dog food with glucosamine and no meat byproducts, no grain, great flavor. Not designed only for underweight dogs, it is great for puppies through elderly dogs. Yes, it is labeled an adult dog food and that is what it is, but it is safe for your large growing puppy. 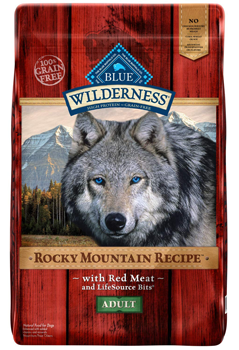 Meat will always be the first and primary ingredient in any Blue Buffalo dog food. This particular formula starts with deboned lamb and fish meal. All of the formulas in this brand contain meat first and not just chicken. They all contain three meats. This not only gives dog the best proteins, it also makes the food very tasty for them. It contains blueberries, raspberries, sweet potatoes, tomatoes and peas. Designed for highly active dogs, this formula is great for putting weight and muscle on your dog. This is one of the best dog food with glucosamine. With chicken as the first ingredient followed by chicken meal, it has the protein your underweight dog needs. However, it is not grain free. Glucosamine and Omega Fatty Acids. Most of us do not think of Purina as high quality, specialized dog food, rather an ordinary, grocery store brand. Still this is a high protein formula that creates a balanced diet with all its nutrients and vitamins, grain free. Chicken and chicken meal are main ingredients. 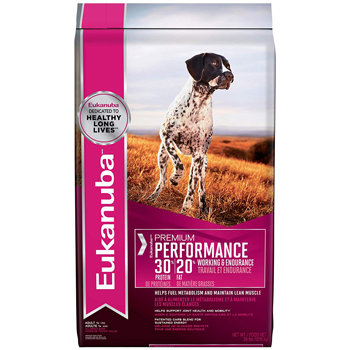 This is the only Eukanuba product in the dog weight gain category, and it is one of the best. 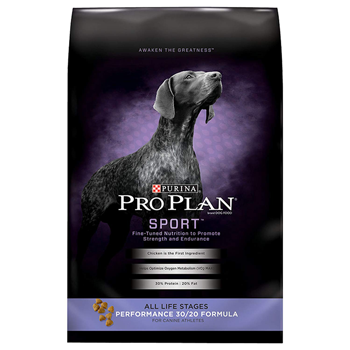 This product has the most protein that Eukanuba has in any product at 30%. The same is true of the level of fat at 20%. It is especially made for sporting and working dogs. No artificial colors, preservatives, and flavors. This is an interesting high calorie dog food as it is slow cooked to increase the ability of the dog to digest it. 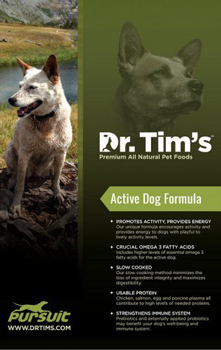 It was developed by a Ph.D. Canine Nutritionist and a Competitive Canine Sport Veterinarian. There is a strong emphasis on the immune system and the dog’s gastrointestinal health. It contains chicken, salmon, eggs and Porcine Plasma for protein. 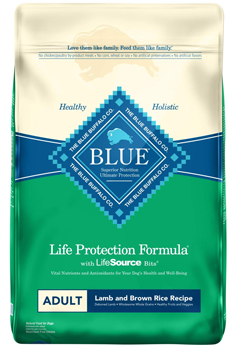 This Blue Buffalo formula is made with red meat rather than chicken, pork or salmon. Red meat is the first ingredient. Grain free and all natural, no by-products of any kind are used. Nothing artificial such as flavoring or preservatives. Let’s review what we have learned about feeding a low weight dog. There can be a variety of reasons why a dog is seriously underweight, including a poor judgement, a disease, homelessness and more. As a Western culture we are consumed by weight, ours and out pets. Unfortunately, it is obesity we are concerned with not underweight. Most people would be glad to be underweight and probably feel that their dogs are healthier if they are a little underweight. Veterinarians warn us about our obese dogs and friends on Facebook harass us if we post pictures of overweight dogs. The problem of underweight dogs might not be as wide spread as obesity, but we need to change our mindsets and notice those underweight dogs. Even if your dogs are never underweight, there could come a day when they are. Yes, being underweight can be caused by homelessness and living on the streets or being abandoned. In fact, those are the things that bring our attention to underweight dogs. Recall the reasons for underweight dogs that we have talked about earlier. Inadequate diet- if you feed a medium dog with food designed for small or toy dogs.Also if you feed a large or giant dog with food designed for a medium or small dog. That food would not give your dog the nutrients and calories he needs to have adequate weight and muscle mass. There are diseases that could cause your dog to lose too much weight. This includes kidney disease, heart disease, cancer and diabetes are just a few. Checking with your veterinarian is the first thing to do if you notice your dog is losing weight even if it is eating normally. Worms and parasites can take the nutrients your dog needs. If your dog is lethargic, doesn’t want to play AND is losing weight, see your vet right away. If he is vomiting, has diarrhea, coughs or needs to urinate a lot more than usual AND is losing weight, see your vet right away. Once the underlying cause of your dog’s weight loss is addressed and you need to get the weight back on, do what we have been talking about throughout this article. An underweight dog needs between 20 – 30% protein and 15-20% crude fat in every meal and depending on their weight need 300+ calories in every meal. The average dog food has 7% protein and 5% fat. The answer is what we have been saying here, feed them a high calorie dog food, high protein and high fat dry food. You can supplement this with wet food that is 100% meat and therefore will have a very high amount of protein and fat. You don’t want to feed this wet food exclusively because it doesn’t have all the nutrients your dog needs and dry food provides. Free feed if possible. Free feeding means leaving the food out in their bowl, so the dog can feed himself whenever he is hungry. Some dogs like to snack all day long instead of one fixed meal. Some dogs are shy and don’t like to eat in front of people. Put the bowl in an out of the way site if this is your dog. If you are a multiple dog household, free feeding isn’t usually successful, and you need to know how much your underweight dog is consuming daily. If you need your dog to eat 1500 calories in a day and free feed in a multiple dog household, you can’t be sure no other dog has eaten any. So, for you multiple private feeding per day is recommended. This means you take the 1500 calories and divide it into at least 3 but preferably 6 smaller meals every day. There are many other ways you can get your underweight dog to eat enough to gain back the weight. You can add supplements, vitamins and raw meat to any of these foods. Be careful with raw beef as it can cause pancreatitis and that can be fatal. Use small amounts. These foods that we mentioned gives your dog a serious boost in calories, crude protein and crude fat. Most also have probiotics and Omega fatty acids. Before you choose one make sure you have checked with your veterinarian about the amount of calories, protein and fat you dog needs daily to gain weight and build muscle. Remember, you don’t want a fat dog you want a healthy dog. So, don’t overfeed. It will take time to get him back up to the healthy weight you want him to be at. These foods will help you to do it. Just check with your veterinarian before you start any new feeding regimen. 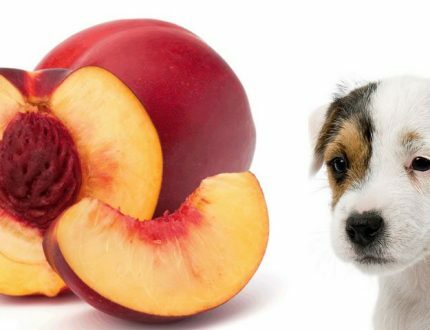 Can I Give my Dogs Nectarines?﻿ Can Dogs Eat Nectarines? My golden retriever puppy had problems with weight gain, vet recommended him the same raw dog food which is mentioned here. It actually helped for pup to gain weight. It’s high quality food, but pricey. finally, article about dogs weight gain!! I’m willing that products mentioned here really works, maybe someone tried dog food nr.1?